Being eaten alive? No problem. 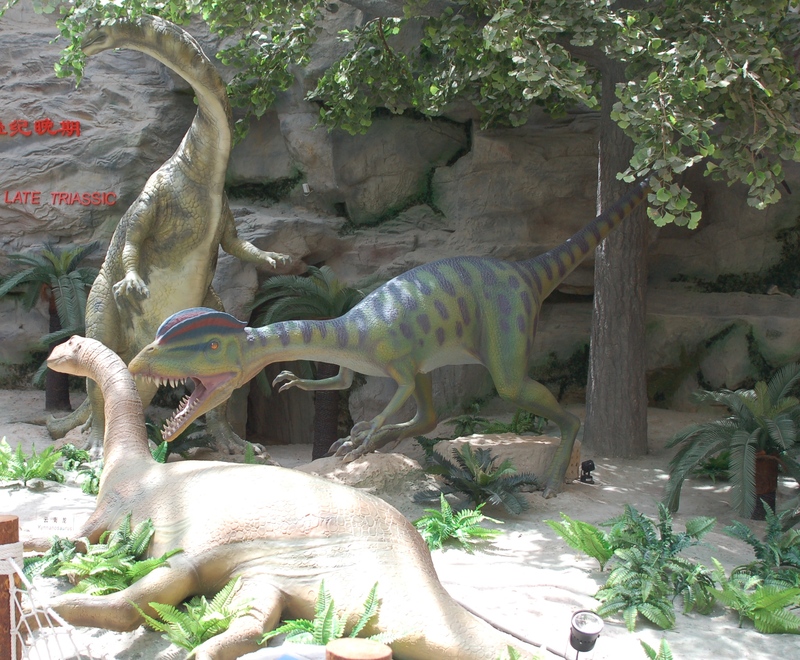 This little diorama is from the Beijing Natural History Museum. The place as a whole is actually very good (apart from the terrible aquarium section and frankly terrifying human biology section) and includes a nice dinosaur hall. Bolted on the side is a little covered area full of life sized dinosaurs and other reptiles that are a real mish-mash. In general the models are very well made, with good details like realistic colouration, nice skin patterns, proper claws and teeth etc., and put in a good setting. On the other hand the gross anatomy of some is frightening like tail dragging sauropods and a snake-tailed Pteranodon. This one I have decided to post simply because it makes me laugh. The models are a couple of the best there and look really good, but I just love the juxtaposition of the roaring charging Dilophosaurus, slavering jaws agape, and the completely nonchalant Lufengusaurus who seems to be quite oblivious to what is going on just three feet away and is calmly waiting to be ripped to bloody shreds by a predator nearly its own size. How peaceful. If you look over the list of links on this site there is one that pretty much sticks out as being the only non-palaeontolgoy website on there and that is the imperious ‘bad science’. 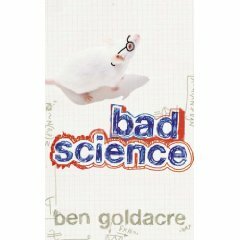 However, as I have barely mentioned it at all in the past, and the author Dr Ben Goldacre (a medical doctor and lecturer) now has a book out of the same title that I have just finished reading, there was never a better opportunity. The site (and newspaper column and book for that matter) are pretty much unique on the web in that they tackle science communication, and the media especially, head-on. So that’s an actual, real, practicing scientist, writing in a national newspaper, and primarily complaining about the poor way in which the media treats scientists. It really is a very pleasant concept indeed. Both his website and columns in the Guardian deal with a mixture of media savaging and addressing bad science at its core – poor research papers. It appears that the medical community have to put up with far worse than the rest of us when it comes to poor research being published, with all kinds of issues over reviews and referees before we even start on the drugs companies and questions of ethics and controls in human experimentation. Of course the issues are so much more important when two extra factors have to be taken into consideration, the first is that fully half or more of all media reports on science are about health (so it gets far more attention than other fields) and secondly that of course the people at the front line of this (practicing doctors) do not have the time to wade through all the new papers and research and much of their training is well away from this kind of core academia, making them more vulnerable to poor science as they may not pick it up. The front end of both of these problems is lives – manipulate the results of a drug test and tens of thousands of people will be taking a drug that has a serious side effect and will ultimately kill people. I’m incredibly glad I’m not in the field of medicine. So onto the book itself. Two in a day again, I am being for too productive. Sill this is cathartic and has put me in a foul mood and is worth highlighting as one of the pitfalls of science. (There are plenty more here if you want them). I am a young researcher and I’m currently applying for a variety of jobs and grants to try and extend my career in palaeontology beyond the end of my current contract. As such, each new publication is valuable and every accepted (or better yet, published) manuscript goes a long way to improving my CV and the chances of getting a job. However, that is reliant on the actual journals doing their job, which leads me to the (current) source of my anger. Nearly seven months ago I submitted a large manuscript to a leading palaeontolgoical journal (I won’t say which, that is rather unfair) which had taken me a long time to assemble – it represents a major bit of my work of the last year or so. Typical journal review times are about three months, but being generous I gave it four before I actually contacted the journal to ask if there was any news on my paper. The answer? They had not even sent it out for review, but ‘would do so shortly’. Fast forward another three months and I kind of assume that things will be done by now, they have sent it out, it was well before the new University year started and the autumn meeting season, so researchers should have a bit of time free. The response I got back yesterday? The replies from the referees came back in September, and the editor was waiting to ‘make a decision’ (which frankly sounds a awful lot like ‘no’). So there you have it, a huge piece of my research has sat with the journal for more than half a year, and I still do not even have a reply yet, and that is very likely to be ‘thanks, but no thanks’. I could have sent this piece to two or even three journals in this time and had a response by now, had the thing accepted (because even if there are problems, a couple of rounds of review will soon iron those out) and added to my CV. Instead I have nothing. At all. And yet it seems that the referees actually did their jobs in about six weeks, which is actually pretty fast, and the delays have been simply a case of the journal not actually doing anything with the manuscript, and not telling me about the delays either except when I ask. I wonder if I should ever bother using this journal again, I am exaggerating of course, but my career could hinge on this. A 30 page paper in a major journal would go a long way to showing my credentials as a researcher and the thing could be in press by now with a faster journal. Cheers guys. Oh, and incidentally, this is the second time this has happened this year, the other journal lost my manuscript for five months and didn’t tell me, even when my co-author inquired as to why it was taking so long. Magic. An incredibly brief photo and caption this time out. Does anyone know what this is, and thus work out the incredibly tenuous link to cladistics? Should provide seconds of amusement if you are psychotically interested in phylogenetics and Mexican botany. 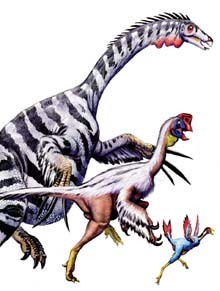 Hmmm, well that description probably fits someone somewhere, but as this is ostensibly a blog about dinosaurs and pterosaurs, it is pretty unlikely they’ll ever find this post. A favourite phrase of mine is that the Berlin Archaeopteryx is “the single most identifiable fossil in the world”. It is absolutely iconic in so many ways – birds, dinosaurs, feathers, flight, evolution, palaeontology and the history of science are all reflected in its past and present. There are probably more identifiable or recognisable things out there is a sense (T.rex being the most obvious candidate) but as a single entity, this one fossil must be far out in front. Even if someone cannot tell you that it is “the Berlin Archaeopteryx” they will still know what it is (that flying dinosaur thing) and will have seen it before and be able to recognise it. Just look at how often it is used literally as an icon on the cover of books, on internet pages, as a logo, in journals etc. For both the public and the scientific community it is immediately recognisable in way that even T. rex and Triceratops are not. It might therefore be a surprise to some to learn just how much it has changed over the years. Unsurprisingly there are various small bits of damage that have accumulate over the years through accidents, preparation, casting and other endeavours but one big change has happened, which few people are probably aware of. Another quick post, but one that is well worth it I feel just to have it out on the internet. I have noticed that an awful lot of websites, articles and the rest love their feathered dinosaurs and go to no end to report them, review them or mention them. 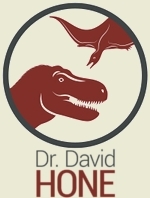 Reconstructions of feathered tyrannosaurs and oviraptorsaurs abound before we even start on the dromaeosaurs. They get everywhere in short, and while the fossil evidence for feathered dinosaurs is unambiguous and definitive, it is surprising just how few examples there are. Of course it is reasonable to reconstruct a great many taxa with feathers, but in terms of actual species preserved with feathers, the numbers are small. Very small in fact – less than twenty. In recent years there’s been no shortage of feathered theropod fossils, avian and non-avian, from the People’s Republic of China. Almost all of them come from the Lower Cretaceous Yixian Formation of western Liaoning Province, historically a part of Manchuria. The exquisitely preserved Yixian fossils, which include everything from plants to insects to mammals in addition to the famous feathered wonders, give us an astonishingly clear window into an Early Cretaceous ecosystem. However, it must be said that dinosaurs of a feather do not always flock entirely together. The profusion of specimens from the Yixian Formation has tended to overshadow the small number of highly intriguing feathered theropods that have been collected at another locality, Daohugou in eastern Inner Mongolia. The Daohugou beds are practically across the provincial border from the Yixian of western Liaoning, and are similar to the Yixian in many respects: both are lacustrine deposits that have yielded a mixture of plants, invertebrates, non-dinosaurian vertebrates such as salamanders and pterosaurs, and feathered dinosaurs. However, the Daohugou beds are substantially older, being Middle to Upper Jurassic rather than Lower Cretaceous. Two posts in a day eh? You are spoiled. Anyway this is just a heads up for tomorrow’s (or Friday’s depending on excatly where in the world you are) guest post by my friend and colleague Corwin Sullivan. For those who follow new dinosaur discoveries, the next issue of Nature holds a new and exciting feathered specimen from (where else) China. As one of the authors, Corwin has kindly agreed to give us some insider information in a special post on the Musings so hurry back. This really is a self-titling piece. I have had this photo sitting around for ages waiting to use it in context and frankly, haven’t found one, so it seemed most pertinent just to shove it up on its own. Very little has been written about Angustinaripterus and with good reason, you are looking at all there is of the only specimen, a most unusual situation for a pterosaur – known only from a skull and a 3-D one at that. It dates from the Middle Jurassic of central China (Dashanpu, Zigong) that gives us all kinds of dinosaurian goodies like Gasosaurs, Gigantspinosaurs and a whole raft of unusual sauropods. Angustinaripterus was a large-ish rhamphorhynchoid pterosaur (probably about 1.5 m in wingspan, though obviously that’s a guesstimate) that probably caught fish with its enormously elongate teeth. I have actually referred to this before here on the old Mk.1 musings but now you get the bonus of a full picture in colour. Lucky you.